HUD announced the FY 2018 awards for new projects, including those awarded under DV bonus. 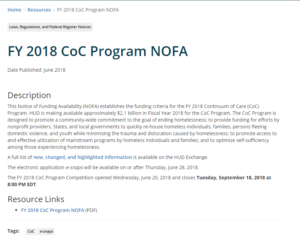 The Continuum of Care (CoC) Program Competition Application is a one-year grant application submitted by the San Francisco CoC to the U.S. Department of Housing and Urban Development (HUD). Below, please find the posting of all parts of the Complete FY 2018 CoC Consolidated Application, including the Priority Listing with all project applications accepted and ranked or rejected and all attachments that will be submitted to HUD. On July 20th the CoC Program Competition NOFA was announced. The information can be found on the HUD website. The Bidders Conference will cover the San Francisco Continuum of Care competition for funds. All new project applicants for Continuum of Care permanent housing grants and renewal applicants are strongly encouraged to attend. Please bring your laptops as part of an optional help session to log into e-snaps.